Commercial Shower Curtains, SureChek and Regency Shower Curtains. Scroll down to see our selection of commercial shower curtains for sale. Commercial shower curtains are used widely in hospitals, nursing homes, schools and institutions to help control bacteria in bathing areas. We carry a large selection of commercial shower curtains for facility and home use. Our commercial shower curtains come in 3 standard lengths and 10 standard width combinations and are made of either antimicrobial SureChek or standard Regency material. What is a commercial shower curtain? Commercial shower curtains are specialize shower curtains typically used in facilities where bathing areas are used by multiple people. Commercial shower curtains have two main purposes: to provide privacy and to prevent water from flooding the bathroom. Commercial shower curtains are made of a heavy duty vinyl with an antimicrobial coating that helps prevent mold and soap scrum build up. This feature also makes commercial shower curtains easy to clean and maintain during multiple uses. 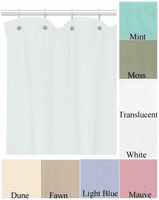 Designed in a variety of colors, commercial shower curtains can help make any bathing area more functional.